Objective To determine the safety and efficacy of balloon vs sham venoplasty of narrowing of the extracranial jugular and azygos veins in multiple sclerosis (MS). Methods Patients with relapsing or progressive MS were screened using clinical and ultrasound criteria. 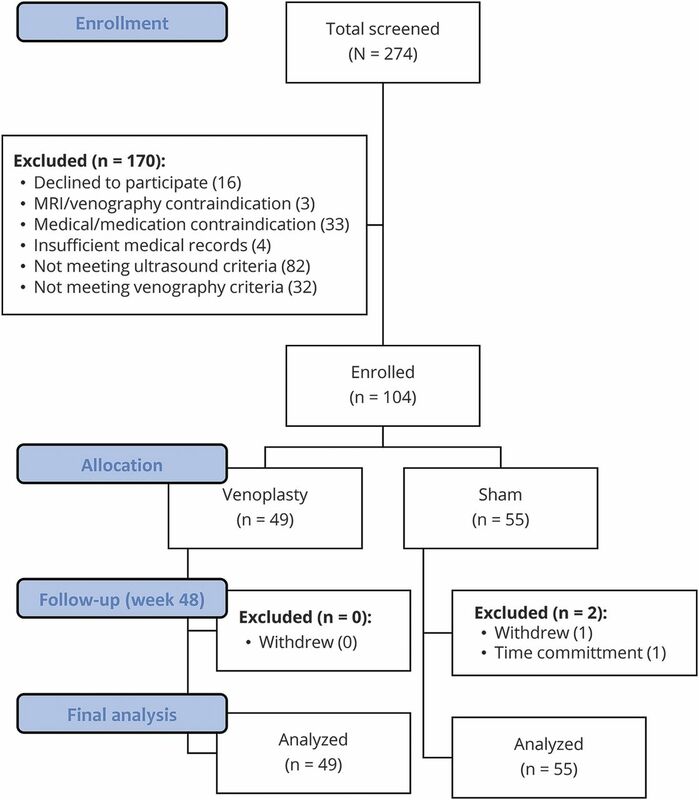 After confirmation of >50% narrowing by venography, participants were randomized 1:1 to receive balloon or sham venoplasty of all stenoses and were followed for 48 weeks. Participants and research staff were blinded to intervention allocation. The primary safety outcome was the number of adverse events (AEs) during 48 weeks. The primary efficacy outcome was the change from baseline to week 48 in the patient-reported outcome MS Quality of Life–54 (MSQOL-54) questionnaire. Standardized clinical and MRI outcomes were also evaluated. Results One hundred four participants were randomized (55 sham; 49 venoplasty) and 103 completed 48 weeks of follow-up. Twenty-three sham and 21 venoplasty participants reported at least 1 AE; one sham (2%) and 5 (10%) venoplasty participants had a serious AE. The mean improvement in MSQOL-54 physical score was +1.3 (sham) and +1.4 (venoplasty) (p = 0.95); MSQOL-54 mental score was +1.2 (sham) and −0.8 (venoplasty) (p = 0.55). Conclusions Our data do not support the continued use of venoplasty of extracranial jugular and/or azygous venous narrowing to improve patient-reported outcomes, chronic MS symptoms, or the disease course of MS. Classification of evidence This study provides Class I evidence that for patients with MS, balloon venoplasty of extracranial jugular and azygous veins is not beneficial in improving patient-reported, standardized clinical, or MRI outcomes. We conducted a randomized, sham-controlled, double-blind, interventional trial in relapsing-remitting and progressive forms of MS18 to determine short- and long-term safety and efficacy on patient-reported outcomes (PROs), and standard clinical and MRI outcomes up to 48 weeks. Between May 29, 2013, and August 19, 2015, we recruited participants with relapsing-remitting MS (RRMS), secondary progressive MS, and primary progressive MS at 4 Canadian academic centers with MS clinics and interventional radiology expertise (University of British Columbia [UBC] Hospital, Vancouver; Health Sciences Centre, Winnipeg; CHUM, Hôpital Notre-Dame, Montreal; Hôpital Enfant-Jesus, Québec). The following were inclusion criteria: age 18 to 65 years, diagnosis of definite MS by the 2010 McDonald criteria,19 an Expanded Disability Status Scale (EDSS)20 score between 0 (i.e., minimal disability) and 6.5 (i.e., using bilateral aids to walk), neurologically stable disease within the 30 days before screening. In addition, participants fulfilled at least 2 ultrasound criteria for CCSVI defined by the Canadian Institutes of Health Research Imaging Expert Panel (appendix e-1, links.lww.com/WNL/A720): reflux in the internal jugular vein (IJV) and/or vertebral vein; reflux present in the deep cerebral veins; B mode IJV stenosis; absent IJV and/or vertebral vein flow; and negative IJV cross-sectional area. Participants had to have confirmation on catheter venography of >50% narrowing affecting at least 1 of 3 extracranial veins (either internal jugular and/or azygos).6 Participants on standard disease-modifying therapies (DMTs) were permitted to continue on medication, and changes were allowed for on-study relapses after randomization. Exclusion criteria included treatment with vasodilators, parasympathomimetics, sympathicolytics, calcium channel blockers, previous venoplasty and/or stenting, previous jugular or subclavian central line or major neck surgery or radiation, previous contrast allergy, inability to undergo MRI, inadequate medical records confirming diagnosis and disease course, and inability to complete all study visits. After randomization and intervention, participants were followed for 48 weeks with adverse event (AE) assessments, standardized PRO scales (72 hours and weeks 2, 12, 24, 36, and 48), Multiple Sclerosis Functional Composite (MSFC)21 and EDSS scores (weeks 2, 12, 24, and 48), and MRI and ultrasound (weeks 24 and 48) assessments. The clinical research ethics boards at the 4 participating centers approved the study protocol. The trial was registered with clinicaltrials.gov NCT01864941. Personnel at all sites underwent standardized training for ultrasound (L.M. ), venography (L.M. ), and venoplasty (L.M. and G.S.) procedures. Venography was performed under conscious sedation, and the duration of time within the angiography suite was uniform for both venoplasty- and sham-treated participants. A 5-French diagnostic catheter was introduced through the common femoral vein to selectively catheterize the right and left IJVs as well as the azygos vein using a standardized protocol.6 Venous stenosis was determined by dividing the minimum (narrowest) lumen diameter by the reference lumen diameter (normal vein diameter proximal or distal to the stenosis).6 Participants with >50% narrowing of any of the 3 veins were randomized (1:1) to either sham or active balloon venoplasty of all narrowed veins under study. The venoplasty participants were treated with an angioplasty balloon 2 mm greater than the nominal vein diameter, which was inflated for 60 seconds. A repeat venoplasty was performed for persistent narrowing >50%. The participants randomized to sham had a catheter that was advanced across the stenosis and left for 60 seconds. Stratified treatment randomization (RRMS vs progressive MS course18) at each site was completed by a permuted-block size of 6 to reduce the likelihood of obtaining unbalanced groups. The randomization table was generated by an independent statistician. Up to a maximum of 50% progressive disease was required for enrollment per site. Treatment assignments were sealed in individual envelopes, only opened after eligibility was confirmed, and resealed after the procedure. All participants and assessors were blinded to intervention assignment. The interventional team was not involved in any outcome assessments. The primary safety outcome included all AEs that are clinically significant and/or potentially related to study procedure and/or serious up to week 48, as determined by the principal investigators and in accordance with the International Conference on Harmonization.22 The primary efficacy outcome was the change in the MS Quality of Life–54 (MSQOL-54) physical and mental composite scores23 from baseline to week 48. Secondary efficacy outcomes were the changes in MSQOL-54 physical and mental composite from baseline to 72 hours to ensure an early, transient effect was not missed; Fatigue Severity Scale,24 North American Research Committee on MS pain scale,25 and CCSVI symptom scale26 from baseline to 72 hours and week 48; and change in EDSS (median) and MSFC (mean) from baseline to week 48. Protocol-defined relapses were a 1-point increase in EDSS or a 1-point change on any functional status score representative of the relapse location. Combined unique active (CUA) lesions, defined as a contrast enhancing lesion on T1-weighted scan or a non-T1 enhancing, new/enlarging T2 lesion, compared to the previous MRI were assessed by the UBC MS/MRI Research Group from brain MRIs with contrast performed at baseline, week 24, and week 48. Study data were collected and managed using REDCap hosted at the British Columbia Children's Hospital Research Institute.27 Independent clinical research associates monitored source documents, case report forms, and database entries prior to database lock. An independent medical monitor (S.I. : cardiologist, UBC) reviewed all serious AEs (SAEs). An independent data safety monitoring board, which included a vascular surgeon, neurologist, ethicist, and statistician, reviewed AEs and trial progress. The number of participants to be included in this phase II trial was based on the primary efficacy outcome, a mean change in MSQOL-54 composite scores from baseline to week 48. Assuming an SD of 20,23 40 participants per group would give 60% power to demonstrate a difference of 10 points on the MSQOL-54 composite score (an effect size of 10/20 = 0.5) using a 2-tailed t test at the significance level of 0.05. At least 100 participants were randomized anticipating a potential withdrawal rate as high as 20%. The analysis plan was developed before database lock and unblinding. Analyses (safety and efficacy) were performed on the intention-to-treat population (all patients randomized) and based on data collected up to week 48. No imputation of missing values was performed. If individual patients had missing values for a particular outcome, those patients were not included in the analysis of that outcome. For the primary safety outcome (significant AEs, SAEs, and venography complications up to week 48), the distribution of the total number of AEs per participant between groups was compared with the Fisher exact test (noncontinuous variable). We also applied negative binomial regression analysis to the number of AEs per participant to estimate the relative rate; logistic regression to compare the proportion of participants having ≥1 AE; and more detailed versions of the regression analyses adjusting for covariates. The changes from baseline for the efficacy outcomes (PROs, MSFC, and EDSS) were treated as continuous outcomes compared using a Student 2-sample t test. Additional regression analyses used the baseline level of the outcome as a covariate. At each follow-up time, PROs and MSFC were dichotomized as “improved” or “not improved” relative to the participant's baseline value and compared between groups using the Fisher exact test and logistic regression. Protocol-defined relapses were compared using the Fisher exact test and logistic regression analysis, and MRI CUA lesions were analyzed using the Fisher test and negative binomial regression. The trial was conducted in accordance with the provisions of the International Conference on Harmonization Guidelines for Good Clinical Practice and the Declaration of Helsinki.22 This study provides Class I evidence for assessing whether balloon venoplasty of extracranial jugular and azygous veins is beneficial in improving PROs, standardized clinical, and MRI outcomes in patients with relapsing or progressive MS.
Anonymized data can be made available to qualified investigators upon request to the corresponding author. The first participant was randomized on May 29, 2013, and the last participant completed week 48 on July 28, 2016. We screened 274 patients, of whom 104 were randomized (49 venoplasty, 55 sham) across the 4 centers (figure 1). Failure to meet ultrasound criteria (n = 82), medical contraindications (n = 33), MRI or venography contraindications (n = 3), or insufficient medical records (n = 4) accounted for the triage of 122 patients who volunteered to participate. Sixteen participants who were potentially eligible for enrollment declined to participate in further screening with venography. One hundred thirty-six participants had venography performed, and of these, 104 (76%) fulfilled the final enrollment criteria (>50% narrowing) and were randomized. Overall retention to week 48 was 103 participants (98%). One participant randomized to sham treatment withdrew at week 24 because of a time conflict. One participant randomized to sham only completed MRI and blood work at week 48. The mean age at enrollment was 50.5 years (range 33–65) with a mean disease duration of 17 years; 65% of participants were women (68/104) and 62% (64/104) had RRMS (table 1). Sixty-nine percent of participants with RRMS (44/64) were on DMTs. Characteristics were similar between treatment groups and centers. On baseline venography, 50% of participants (32/64) with RRMS and 72% (29/40) with secondary progressive or primary progressive MS had multiple vessels with >50% narrowing. There was a transient increase in MSQOL scores within 72 hours (mental scores) and 2 weeks (physical scores) in both groups. The mean improvement from baseline to week 48 for MSQOL physical score was +1.3 and +1.4 (sham vs venoplasty p = 0.95); MSQOL mental score +1.2 and −0.8 (sham vs venoplasty p = 0.55); fatigue score +0.2 and +0.1 (sham vs venoplasty p = 0.65); and pain score was +0.1 and −0.2 (sham vs venoplasty p = 0.19). 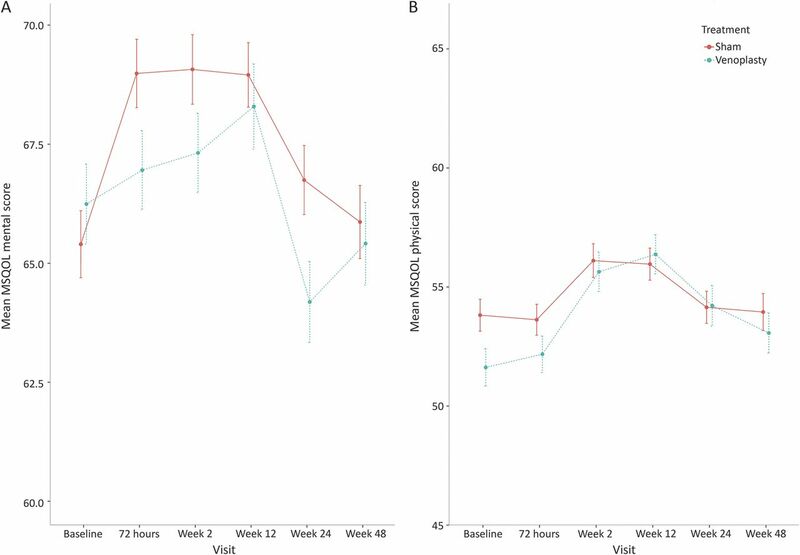 There was no significant difference in the proportion of sham and venoplasty participants who had an improvement in a PRO from baseline to week 48 (figure 2). There was no difference between sham and venoplasty groups on all PROs at 72 hours post procedure (table 2; table e-1, links.lww.com/WNL/A719). Improvements in the CCSVI symptom scale for limb temperature occurred in 6/50 (12%) sham and 4/48 (8%) venoplasty (p = 0.74), limb color in 5/50 (10%) sham and 3/48 (6%) (p = 0.71) venoplasty, brain fog in 9/50 (18%) sham and 7/48 (15%) venoplasty (p = 0.59), and visual function in 6/50 (12%) sham and 3/48 (6%) venoplasty (p = 0.49). A higher scale score indicates a higher quality of life. A similar, transient increase in scores was seen in the venoplasty and sham groups. MSQOL-54 = Multiple Sclerosis Quality of Life–54. There was no improvement in MSFC from baseline to week 48 for the sham (0.0) or venoplasty (−0.4) group (p = 0.18). There was little change in median EDSS score at week 48 in either group. Eleven participants (6 sham, 5 venoplasty) had a protocol-defined relapse (p = 0.91); and 21 and 18 participants, respectively, had at least one MRI CUA lesion (p = 0.88) (table 3). Of the 44 (24/55 sham, 20/50 venoplasty) participants on DMT at baseline, 1 sham participant discontinued DMT, 3 (1 sham, 2 venoplasty) switched DMTs, and 1 venoplasty participant had a temporary interruption of DMT use. Two sham participants were started on a DMT after baseline. The mean percent change from baseline to week 48 in brain volume was −0.693 and −0.707 (p = 0.93) for sham and venoplasty groups. Subgroup analysis of participants with the presence or absence of gadolinium-enhancing lesions at baseline, relapsing or progressive disease course, or the presence or absence of azygos stenosis could not detect a benefit of venoplasty compared to sham on any outcome. No deaths occurred during the study. No periprocedural (within 48 hours) SAEs requiring hospitalization were reported. There was one asymptomatic internal jugular dissection that occurred in the venoplasty group that did not require intervention or hospitalization. Three (5%) sham and 3 (6%) venoplasty participants reported moderate or severe pain during the procedure (p = 0.88); 6/54 (11%) and 4/49 (8%), respectively, reported postprocedure pain (p = 0.62). Twenty of the 55 (36%) sham participants reported 37 AEs and 17/49 (35%) venoplasty participants reported 22 AEs within 48 hours. The most commonly reported periprocedural AEs were groin pain (n = 8/104, 7.7%), hematoma (n = 9/104, 8.6%), and neck pain (n = 6/106, 5.7%). The number of participants with any AEs reported from baseline to week 48 was 42% (23/55) for sham and 43% (21/49) for venoplasty (p = 1, Fisher exact test) (table e-2, links.lww.com/WNL/A719). The most commonly reported AEs were gastrointestinal reflux or discomfort (n = 8), paresthesia and/or lightheadedness (n = 8), arthralgia (n = 6), and general malaise (n = 4). There were no cases of venous thrombosis up to week 48. Six (5.7%) SAEs were reported (1/55 [2%] sham, 5/49 [10%] venoplasty), none of which were related to the study procedure in the opinion of the blinded physician. The SAEs were generalized seizure (1 sham, week 17), sepsis (2 venoplasty, weeks 20 and 25), bleeding of a previously undiagnosed cerebral aneurysm (1 venoplasty, week 46), myocardial infarction (1 venoplasty, week 28), and pulmonary embolism (1 venoplasty, week 17). We chose not to use vascular stents because of concerning reports of serious complications including stent thrombosis,30 stent embolization, and death.15 However, venoplasty alone can also be associated with SAEs, necessitating careful monitoring in this trial.31 The original open-label venoplasty trial did not use intravascular stents and reported an improvement in symptoms during 18 months of follow-up.2 We hypothesized that venoplasty without stenting should be sufficient to detect efficacy within 48 weeks without putting patients at greater risk of complications related to intravascular stents. Our findings support this decision, given that significant AEs were similar between the sham and venoplasty groups at 48 hours and 48 weeks post procedure, with no evidence of thrombosis up to week 48. However, SAEs were numerically higher in the venoplasty group at 10% vs 2% for sham. There are important MS symptoms, including fatigue and pain, that are not adequately captured by routinely used clinician-assessed scales (EDSS and MSFC). Our study design ensured that we could determine whether the intervention had an early improvement on outcomes meaningful to patients as measured using validated PROs and a novel CCSVI symptom scale. Participants were reassessed over 48 weeks to determine whether any early improvements in symptoms were sustained, and to detect any delayed improvements that may have been masked by periprocedural pain or residual effects of the medications used for conscious sedation. There were no differences between the sham and venoplasty groups on the PROs throughout the 48 weeks. While it is possible that our study was underpowered to detect statistically significant differences, we had surpassed our target enrollment, 99% retention, and our cohort size was larger than the original open-label study.2 We could not detect any trends in any of the PROs and either clinical or MRI outcomes. There was no difference compared to the sham intervention or in the number of participants who had objective evidence of new inflammatory activity (MRI CUA lesion and/or confirmed clinical relapses) or improvement in disability (EDSS or MSFC). This would argue against venoplasty having a disease-modifying mechanism of action. We took great care in standardizing the venography and intervention procedures across the 4 centers. Stratified randomization by disease type at each site reduced the likelihood of obtaining unbalanced study groups. The conscious sedation during venography, and a standardized venography procedure room experience for all participants (i.e., room setup, duration of time in the room, minimal staff present), ensured that all sham and venoplasty participants would have an identical research experience to optimize masking. Venous narrowing >50% was present in 76% of participants, similar to earlier findings in MS.6 We included participants with the progressive form of MS, i.e., those with the greatest unmet medical need for treatments that could significantly improve quality of life. Early reports2 suggested that patients with RRMS were more likely to benefit from venoplasty than patients with progressive MS, but our subgroup analyses did not detect outcome differences between sham and venoplasty for either RRMS or progressive MS patients. Extracranial venous stenosis continues to be proposed as a pathogenic disorder for a variety of neurologic conditions (including Alzheimer, Parkinson, and Ménière diseases). It is not uncommon for patients to experience improvements in their symptoms with intervention, especially when expectations are high. Sham-controlled confirmatory trials are rarely performed for interventional procedures, but they remain necessary. Uncontrolled case series can erroneously suggest a benefit from novel but ineffective therapies.32 This large randomized, double-blind, multicenter clinical trial failed to show superiority of venoplasty compared to sham intervention on patient-reported, clinical, and MRI outcomes. In the face of extraordinary pressure to find a cure for neurodegenerative diseases, this study confirms the importance of well-designed trials to assess the safety and effectiveness of new therapies, including those that may be publicly popular and perhaps less conventional. It is critical to ensure that patients do not undergo procedures that could result in unnecessary costs or morbidity, or lose trust and hope in the vital goals of biomedical research. A.L. Traboulsee: literature search, tables, study design, data collection, data interpretation, writing, and final approval of the manuscript. L. Machan, D.K. Li, A.D. Sadovnick, S. Isserow, J. Illes, D. Klass, J.M. Girard, J. Raymond, R. Vosoughi, B.W. Hardy, G. Siskin, F. Emond, and J.-L. Gariepy: study design, data collection, data interpretation, and final approval of the manuscript. J.N. Bone: statistical analysis, data interpretation, writing, and final approval of the manuscript. The study was primarily supported by cooperative agreements from the Canadian Institutes of Health Research (CIHR), MS Society of Canada, Michael Smith Foundation for Health Research, Research Manitoba, and Ministère de la Santé et des Services Sociaux du Québec. The study design was peer reviewed and approved by CIHR. A.L. Traboulsee reports grants and/or personal fees from Biogen Idec, Chugai, Canadian Institutes of Health Research, Hoffmann-La Roche, Multiple Sclerosis Society of Canada, Sanofi Genzyme, Novartis, Teva Innovation, Consortium of MS Centers. L. Machan reports grants from Canadian Institutes of Health Research, Michael Smith Foundation for Health Research, Multiple Sclerosis Society of Canada during the conduct of the study. J.M. Girard reports grants from Canadian Institutes of Health Research, Ministère de la Santé et des Services Sociaux du Québec, Multiple Sclerosis Society of Canada during the conduct of the study; grants and personal fees from Biogen, Hoffmann-La Roche, Genzyme, personal fees from Novartis, EMD Serono, grants from AB Science outside the submitted work. J. Raymond reports grants from Canadian Institutes of Health Research, Ministère de la Santé et des Services Sociaux du Québec, Multiple Sclerosis Society of Canada during the conduct of the study. R. Vosoughi reports grants from Canadian Institutes of Health Research, Research Manitoba, Multiple Sclerosis Society of Canada during the conduct of the study. B.W. Hardy reports grants from Canadian Institutes of Health Research, Research Manitoba, Multiple Sclerosis Society of Canada during the conduct of the study. F. Emond reports grants from Canadian Institutes of Health Research, Ministère de la Santé et des Services Sociaux du Québec, Multiple Sclerosis Society of Canada during the conduct of the study; personal fees from Biogen Idec, EMD Serono, Teva Innovation Canada, grants and personal fees from Genzyme/Sanofi-Aventis, Novartis, Hoffmann-La Roche, outside the submitted work. J.-L. Gariepy reports no disclosures relevant to the manuscript. J.N. Bone reports grants from Canadian Institutes of Health Research, Michael Smith Foundation for Health Research, Multiple Sclerosis Society of Canada during the conduct of the study. G. Siskin reports no disclosures relevant to the manuscript. D. Klass reports grants from Canadian Institutes of Health Research, Michael Smith Foundation for Health Research, Multiple Sclerosis Society of Canada during the conduct of the study. S. Isserow reports grants from Canadian Institutes of Health Research, Michael Smith Foundation for Health Research, Multiple Sclerosis Society of Canada during the conduct of the study. J. Illes reports grants from Canadian Institutes of Health Research, Michael Smith Foundation for Health Research, Multiple Sclerosis Society of Canada during the conduct of the study. A.D. Sadovnick and D.K. Li report no disclosures relevant to the manuscript. Go to Neurology.org/N for full disclosures. Received by Neurology September 29, 2017. Accepted in final form July 19, 2018. The authors are grateful to the participants in the trial; patient advocates for reviewing and contributing to study design; the independent data safety monitoring board members Dr. Michael Yeung, Dr. David Taylor, Prof. John Petkau, and the late Prof. David Roy; the clinical trial staff; the interventional and postprocedure care teams; and the late Mr. Rick White (statistical support) for their invaluable contributions.
. A prospective open-label study of endovascular treatment of chronic cerebrospinal venous insufficiency. J Vasc Surg 2009;50:1348–1358.e3.
. Jugular venous reflux and brain parenchyma volumes in elderly patients with mild cognitive impairment and Alzheimer's disease. BMC Neurol 2013;13:157.
. Patterns of chronic venous insufficiency in the dural sinuses and extracranial draining veins and their relationship with white matter hyperintensities for patients with Parkinson's disease. J Vasc Surg 2015;61:1511–1520.e1.
. The prevalence of chronic cerebrospinal venous insufficiency in Ménière disease: 24-month follow-up after angioplasty. J Vasc Interv Radiol 2017;28:388–391.
. Prevalence of extracranial venous narrowing on catheter venography in people with multiple sclerosis, their siblings, and unrelated healthy controls: a blinded, case-control study. Lancet 2014;383:138–145.
. Percutaneous transluminal angioplasty for chronic cerebrospinal venous insufficiency in multiple sclerosis: dichotomy between subjective and objective outcome scores. Neurol Sci 2013;34:2205–2210.
. Venous angioplasty in multiple sclerosis: neurological outcome at two years in a cohort of relapsing-remitting patients. Funct Neurol 2012;27:55–59.
. Percutaneous angioplasty of internal jugular and azygous veins in patients with chronic cerebrospinal venous insufficiency and multiple sclerosis: early and mid-term results. Phlebology 2014;29:367–375.
. An observational study of venoplasty in patients with multiple sclerosis. Can J Neurol Sci 2013;40:203–209.
. Feasibility and safety of endovascular treatment for chronic cerebrospinal venous insufficiency in patients with multiple sclerosis. J Vasc Surg 2013;58:1609–1618.
. An endovascular treatment of chronic cerebro-spinal venous insufficiency in multiple sclerosis patients: 6 month follow-up results. Neuro Endocrinol Lett 2011;32:557–562.
. Clinical improvement after extracranial venoplasty in multiple sclerosis. J Vasc Interv Radiol 2012;23:1302–1308.
. Cognitive functioning and subjective quality of life in relapsing-remitting multiple sclerosis patients before and after percutaneous transluminal angioplasty: a preliminary report. Neuropsychiatr Dis Treat 2014;10:1039–1044.
. Endovascular correction of cerebrovenous anomalies in multiple sclerosis: a retrospective review of an uncontrolled case series. Vasc Med 2012;17:131–137.
. Internet-based social networking and its role in the evolution of chronic cerebrospinal venous insufficiency. Tech Vasc Interv Radiol 2012;15:153–157.
. FDA warns about the risks of unproven surgical therapy for multiple sclerosis. JAMA 2012;307:2575–2576.
. Development of a multiple sclerosis functional composite as a clinical trial outcome measure. Brain 1999;122(pt 5):871–882. World Medical Association. World Medical Association Declaration of Helsinki: ethical principles for medical research involving human subjects. JAMA 2013;310:2191–2194.
. Rasch analysis of the Fatigue Severity Scale in multiple sclerosis. Mult Scler 2009;15:81–87.
. Validation of the NARCOMS Registry: pain assessment. Mult Scler 2005;11:338–342.
. Patient-reported benefits of extracranial venous therapy: British Columbia CCSVI Registry. Can J Neurol Sci 2017;44:246–254.
. Research electronic data capture (REDCap): a metadata-driven methodology and workflow process for providing translational research informatics support. J Biomed Inform 2009;42:377–381.
. Endovascular treatment of CCSVI in patients with multiple sclerosis: clinical outcome of 462 cases. Neurol Sci 2013;34:1633–1637.
. Prospective randomized trial of venous angioplasty in MS (PREMiSe). Neurology 2014;83:441–449.
. Complications in MS patients after CCSVI procedures abroad (Calgary, AB). Can J Neurol Sci 2011;38:741–746.
. Adverse events after endovascular treatment of chronic cerebro-spinal venous insufficiency (CCSVI) in patients with multiple sclerosis. Mult Scler 2013;19:961–963.
. What went wrong? The flawed concept of cerebrospinal venous insufficiency. J Cereb Blood Flow Metab 2013;33:657–668.